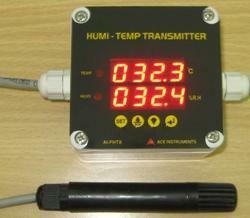 Humidity Transmitters and Sensors are industry standard transmitters with integrated display. Humidity Transmitters come with the option of backlit LCD or 3 Digits x 2 of 7 Segment LED Display. Industry standard 4-20mA for humidity & optional temperature output of 4-20mA with option of RS485 Modbus Communication Great accuracy of /-1.8% R.H. for humidity & /-0.5 Deg. C for temperature is achieved using imported basic sensors from Switzerland. The Humidity Transmitter runs on 24 V.D.C. or optionally on 230 V.A.C., Single Phase. Humidity Transmitters also come for Clean Room Enclosures with Stainless Steel Front Plates & 45 mm. Depth enclosures. Humidity 0.0 to 100.0% R.H.
Flameproof Duct Humidity Temperature Transmitters are especially designed for HVAC applications for simultaneous dual analog 4-20 mA outputs corresponding to temperature & humidity. The Flameproof Duct Humidity Temperature Transmitter is ideal for connecting outputs onto BMS/PLC/SCADA since it provides industry standard 4-20 mA Analog Outputs & also comes with optional RS 485 Modbus communication. Flameproof Duct Humidity Temperature Transmitter is designed for use in hazardous areas & is housed in aluminum LM-6 Body certified by CIMFR, Dhanbad for use in Gas Group Areas I, II, IIA & IIB. The Flameproof Duct Humidity Temperature Transmitter has a measuring range of -30.0 to 60.0 Deg. C for temperature & 0.0 to 100.0% R.H. Non Condensing. It comes with a duct mounting clamp & is best suited for use in hazardous pharmaceutical applications, flameproof clean room applications, Intrinsically Safe applications & ATEX applications. Also available as only flameproof humidity transmitter with only 1 analog output of 4-20 mA corresponding to 0.0 to 100.0% R.H. Non Condensing. 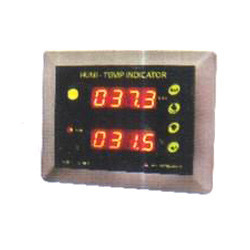 Humidity and Temperature Indicators manufactured by Ace Instruments are 2 line digital display indicators, 1 line each for humidity & temperature measurement. Options include 2 Analog Outputs of 4-20 mA, 1 each for humidity and temperature. The Humi-Temp Indicator Model AI-CRM2A-I is designed to measure the vital parameters of Temperature & Humidity in a single instrument for Clean Room Measurement Applications. Compact size & depth of 35 mm make it perfectly suited for mounting in Clean Room Modular Walls/Brick Walls. The Humi-Temp. Indicator Model AI-CRM2A-I is designed for minimum cabling & easy flush mounting in Modular Wall or Brick Walls of Clean Rooms. The sensors for humidity & temperature can be any sensors from Siemens or Honeywell or Johnson, etc. with industry standard 0-10 V.D.C. or 4-20 mA Output. 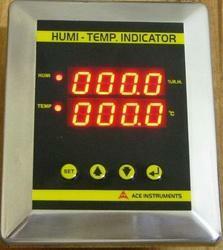 The inputs in the Clean Room Humi-Temp Scanner are user selectable between 4-20 mA or 0-10 V.D.C. Analog with range programmability for each of the 2 parameters. Additional features include integrated buzzer for parameter violation indication with acknowledgment key & delay alarm feature, individual LED for process violation and Isolated RS 485 Modbus Communication. The instruments find immense use in Pharma Clean Rooms, APIs, Bulk Drugs, Electronic Hardware Manufacturing Plants, Test Plants, Green Houses, etc. Easy integration to Building Management Systems ( BMS ) & SCADA interfacing allow quick set up & great control. Wireless Temperature and Humidity Indicator with in-built SMS Alert facility is a state-of-the-art instrument to monitor the parameters of temperature & humidity in critical applications like cold storage, cold chains, food, Pharmaceuticals, bio-medical, logistics, Warehouses, Airports, Hospitals, Machinery Rooms, Ship-Building, etc. The Model TH-GSM Wireless Temperature & Humidity Indicator has an integrated Large Clear Back-lit Dot Matrix Display with live display of temperature & humidity. The TH-GSM has a built-in/optional external high accuracy combination temperature & humidity sensor suitable for temperature range of -20 Deg. C to +100.0 Deg. C & humidity range of 0.0 to 100.0%. R.H. Non Condensing. Time- Bound SMS: SMS Alert of Temperature & Humidity Values on your Mobile over SMS at user programmable intervals. Alarm Status SMS: SMS Alert upon exceeding Critical Levels of any of the 2 parameters of temperature & humidity. The alarm limits are freely programmable by user from front keypad. 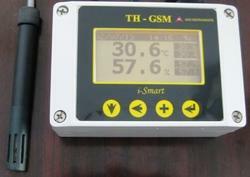 Request SMS: User can request the TH-GSM Wireless Temperature & Humidity Indicator for real time values of both temperature & humidity with time stamp over SMS. The user send a request SMS to the device & the device replies back by SMS of real time values of temperature & humidity. Optional data logging memory of up to 1,00,000 records for both parameters can be provided & customized software for real time monitoring & Excel Sheet Generation of records is available for validations & data logging. Also, email facility is also provided over GPRS wherein an email is sent at the end of the day with the data records in Excel Sheet Format by the Wireless Temperature & Humidity Indicators. Cold Storage Temperature Indicators are available as Digital Temperature Indicators & also as combination digital temperature & humidity indicators. These are small packaged wall mounting type ABS Plastic Indicators with option of 1 Line ( Temperature only ) & 2 line ( Temperature + Humidity ) display. The sensors are wired external sensors such that the sensor can be placed in the cold storage & the display unit can be placed outside the cold storage room. High accuracy of +/-0.2 Deg. C for temperature & +/-2% R.H. for humidity is provided to match the most demanding accuracy applications. The cold storage temperature & humidity indicators also come with optional RS485 Modbus communication to enable communication with SCADA, BMS, DCS or other software applications. ROTRONIC , Switzerland make is a highly accurate handheld indicator that displays relative humidity, temperature and dew or frost point temperature. The HP21 is perfect for spot checking HVAC installations, manufacturing or storage areas and any ambient air measurement within the temperature range of -10 to 60°C (14 to 140 °F). The HP21 is designed to meet a wide range of user requirements Lo In spite of its high end design, the HP21 is ideal even as a simple humidity and temperature indicator. Graphs, statistics, analysis, qualification, etc. 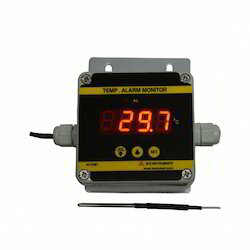 Cold Storage Indicator/Monitor is an economical Cold Storage Facilities Temperature Monitor which simultaneously measures displays alerts user about the critical parameters of temperature humidity in Cold Storage facilities. The Cold Storage Monitor has a wall mounting display unit with 2 line 4 + 4 digit 7 Segment LED Display each 4 digit line displaying the temperature humidity of the Cold Storage room. The sensor is wired with standard wire length of 3 mtrs which enables the display monitor to be placed outside the Cold Storage Room the sensor can be placed inside the room being monitored. The Cold Storage Monitor has an integrated programmable buzzer alarm for alerting in case of any deviation from customer specified temperature humidity limits. We offer the wide range of Temperature and Humidity Indicators with Sensors. Looking for Humidity Transmitters and Sensors ?